Anybody have a source for this thing? It looks mighty photoshoppy. The image info suggests it comes from this blogspot but I can't find it. Someone happens to have a camera that takes pictures in BMP. 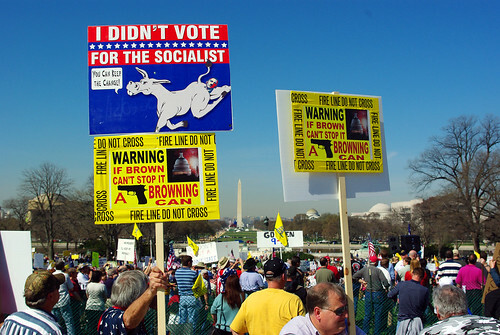 But, only a teabagger would photoshop something like that, and we know their grasp of the language. I wondered how soon the "Photoshop" thing would pop up. Look real close at the white area immediately surrounding the lettering, and compare it to the the white areas of the sign that is away from the text. Notice a difference? Someone is having a laugh at some people's expense. Has this been through Photoshop? They will take up pick ax's and use them on us. That's the peaceful left for you. I guess these demonstrators prefer axe over guns? PS. How dumb one has to be, to assume these are all illegal immigrants as suggested in the video?